Glaceon in game: 584 Who? Important notice! Pokemon Glaceon is a fictional character of humans. Glaceon (Japanese: ????? Glacia) is an Ice-type Pokémon introduced in Generation IV. It evolves from Eevee when it is leveled up near an Ice Rock. It is one of Eevee's final forms, the others being Vaporeon, Jolteon, Flareon, Espeon, Umbreon, Leafeon, and Sylveon. 3.2In the Pokémon Diamond and Pearl Adventure! Glaceon is a quadruped, mammalian creature covered in light-blue fur that can be frozen into sharp quills. It has long, pointed ears, dark eyes, and a small nose. Glaceon has two dark blue, rhombus-shaped markings on its back, and the tip of its tail and feet are the same shade of blue. It appears to be wearing a teal tuque on its head and it has two teal dangles, one on each side of its head. This Pokémon is able to compose small ice crystals around it by controlling its body temperature. Glaceon is usually found in urban areas under the care of humans. It is rarely found in the wild. May's Eevee evolved into Glaceon prior to A Full Course Tag Battle!. It was later used to battle Dawn's Piplup in the Battle Stage of the Wallace Cup in Strategy With A Smile!. A Glaceon appeared in All for the Love of Meloetta! under the ownership of Cynthia. Virgil has a Glaceon which first appeared in Team Eevee and the Pokémon Rescue Squad!. A Glaceon appeared in Eevee & Friends along with an Eevee and its evolved forms. Sara Lee has a Glaceon which first appeared in A Dancing Debut!. A Glaceon made a cameo in A Lean Mean Team Rocket Machine! under the ownership of a Trainer bearing a strong resemblance to Pietra. Glaceon made a small cameo in the beginning of Giratina and the Sky Warrior together with an Eevee and the other six Eeveelutions. A Glaceon also appeared in Sliding Into Seventh!. A Trainer's Glaceon appeared in A Marathon Rivalry! participating in the Pokéathlon held in Camellia Town. A Glaceon made a brief appearance under the ownership of a Trainer in the Lily of the Valley Conference in An Old Family Blend!. 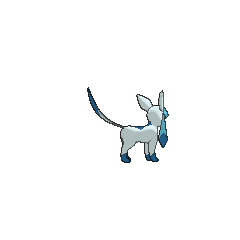 A Glaceon appeared as a mask for the festival in Capacia Island UFO!. A Glaceon appeared in a fantasy in Tag Team Battle Inspiration! where Shauna imagined what Serena's Eevee could evolve into. A Trainer's Glaceon appeared in A League of His Own!. A Glaceon appeared in SM003, during a fantasy. DP076 Glaceon Dawn's Pokédex Glaceon, the Fresh Snow Pokémon and the evolved form of Eevee. Glaceon can freeze the fur on its body, and make it stick out like sharp needles. BW102 Glaceon Ash's Pokédex Glaceon, the Fresh Snow Pokémon. Glaceon freezes the surrounding air by controlling its body temperature. Glaceon in Diamond and Pearl Adventure! In Volume 43, The Kimono Girls added a Glaceon to their team, completing their Eeveelution set. Glaceon had one prior appearance; it was used by a virtual Trainer in the Battle Arcade in the Platinum chapter. In the Pokémon Diamond and Pearl Adventure! 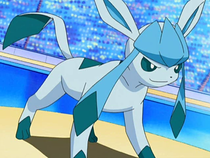 Mitsumi's Glaceon was first seen in The Battle Rages On, battling Jupiter in Lake Acuity. 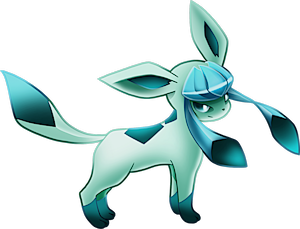 Glaceon appears as a trophy alongside its counterpart, Leafeon. A Fresh Snow Pokémon and a Verdant Pokémon. They are both evolutions of Eevee. Eevee can evolve into seven different Pokémon depending on what it has in its possession and where it is when it evolves. 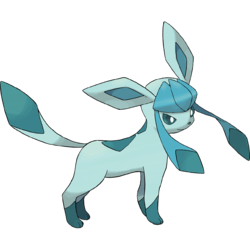 Glaceon is an Ice-type and can freeze all the fur on its body into protective quills. Leafeon is a Grass-type, and the air around it is always fresh and clean. It can control its body temperature at will. This enables it to freeze the moisture in the atmosphere, composing flurries of diamond dust. It freezes its fur into icicles, spiky and sharp, and tackles its prey. Moves marked with a superscript game abbreviation can only be bred onto Glaceon in that game. It shoots hunks of ice that make Pokémon Stopped. Glaceon can always be found playing in the Iceberg Zone. She specializes in Empoleon's Snow Slide and Rayquaza's Balloon Panic! She thought of a racecourse to run in a hot place but later realized that not everyone enjoys running in the heat. 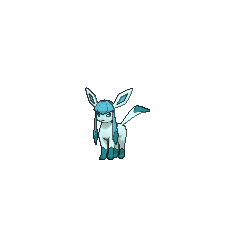 For other sprites and images, please see Glaceon images on the Bulbagarden Archives. Glaceon's Japanese name is the same as the English name of a member of the Hoenn Elite Four. According to the Diamond and Pearl Pokédex, Glaceon, Leafeon, and Umbreon have identical footprints. As there is no Ice Rock in Pokémon HeartGold and SoulSilver, it is impossible to evolve Eevee into a Glaceon in these games. The same applies for Magnezone, Probopass, and Leafeon. All have to be traded from Pokémon Diamond, Pearl, and Platinum to be obtained. 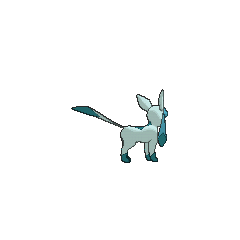 Despite Eevee being obtainable before the Pokémon League in Pokémon Black and White Versions 2, it can not evolve into Glaceon until after the Elite Four is defeated. The same applies with Leafeon. Glaceon shares its category with Vanillite. They are both known as the Fresh Snow Pokémon. Glacia may derive from glace (French for ice), glacier (a large, slow moving mass of ice on land), or grace (as in graceful). French Givrali From givre. Ends with -li like every Eeveelution in French. German Glaziola From glazial. Ends with -a like every Eeveelution in German. Cantonese Chinese ??? Bingyibui Literally "Ice Eevee". Ends with -?? like every Eeveelution in Cantonese. Mandarin Chinese ??? / ??? Bingjinglíng Means "Ice spirit". Ends with -?? / -?? like every Eeveelution in Mandarin.